Combining moldmaking with desktop 3D printing allows engineers and designers to expand the realm of materials they’re using and bring the capabilities of their 3D printer beyond prototyping and into the realm of production. Moldmaking enables production of short-run batches of 150 to 600 parts or testing of mold designs before committing to expensive tooling. 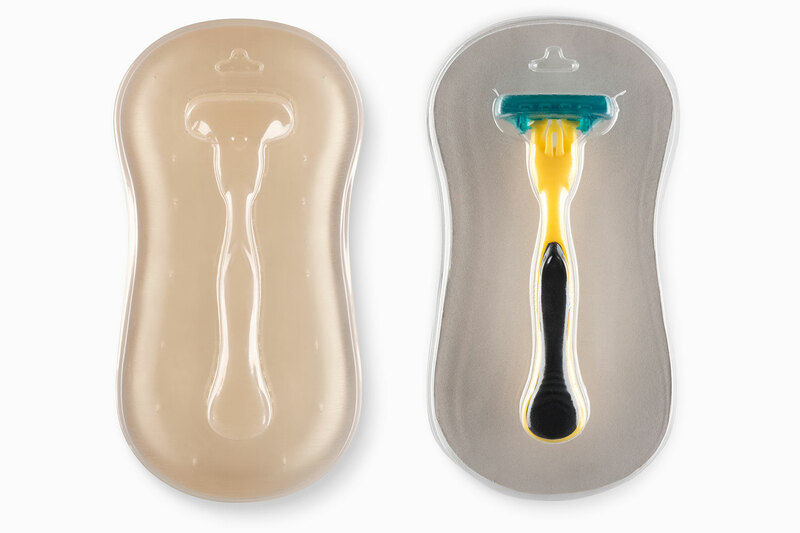 Moldmaking is used across industries by people like product designers, entrepreneurs, and teachers to create short production runs, prototype complex molds, test production in end-use plastics, and generally aid in any situation where it’s necessary to create multiple copies of a part both affordably and easily. 3D printing parts to supplement the molding process tends to be both faster and less expensive than CNC milling, and easier than working with silicone molds. 3D printing molds is typically less expensive and easier than using techniques like CNC machining or silicone casting for small runs. In this post, we’ll walk through three moldmaking techniques easily supplemented by 3D printing: injection molding, casting, and thermoforming. For a more in-depth look at these techniques, as well as design guidelines for moldmaking and 3D printing, watch our recent webinar. Injection molding was invented in 1872 by John Wesley Hyatt, and originally operated much like a hypodermic needle. The modern injection molding machine was fully realized in 1956 with the invention of the reciprocating screw. In the modern injection molding process, a reciprocating screw drives plastic polymer pellets through a hopper into a heated barrel. As the pellets get closer to the heater, they melt and are pushed into the mold cavity, where pressure is applied. After the part forms and cools within the mold, the part is ejected and the mold can be re-used. 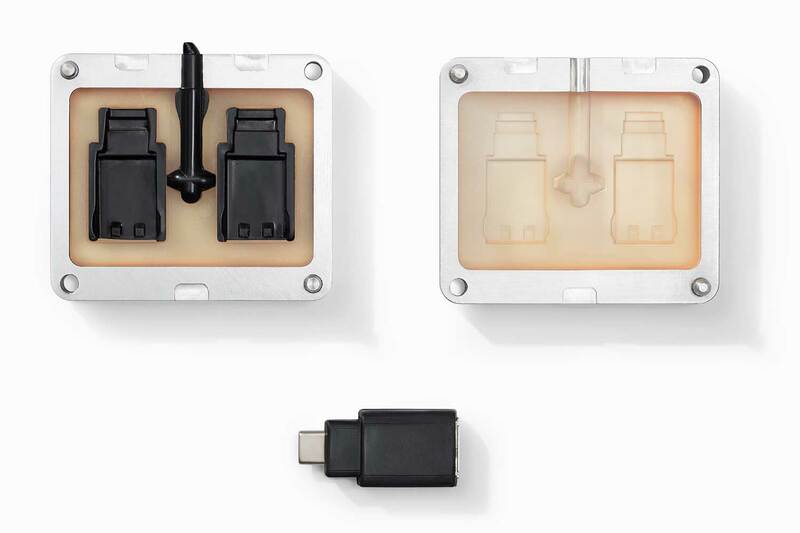 A USB case, created using an injection mold printed directly with Formlabs High Temp Resin. 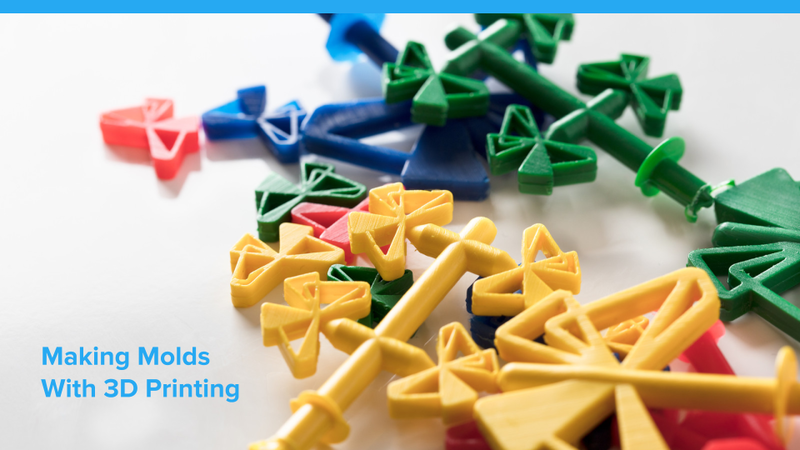 The polymers used by injection molding processes are relatively cheap and can be used to achieve a wide variety of properties, so injection molding is popular for creating packaging and consumer products (fun fact: LEGO bricks, which need to be both strong and precise, are injection molded). Molds can be directly 3D printed in a variety of materials, such as Formlabs Standard Resins or High Temp Resin. The testing for our white paper on injection molding was done using the Galomb Model-B100 Injection Molder, which runs at around $3,500. 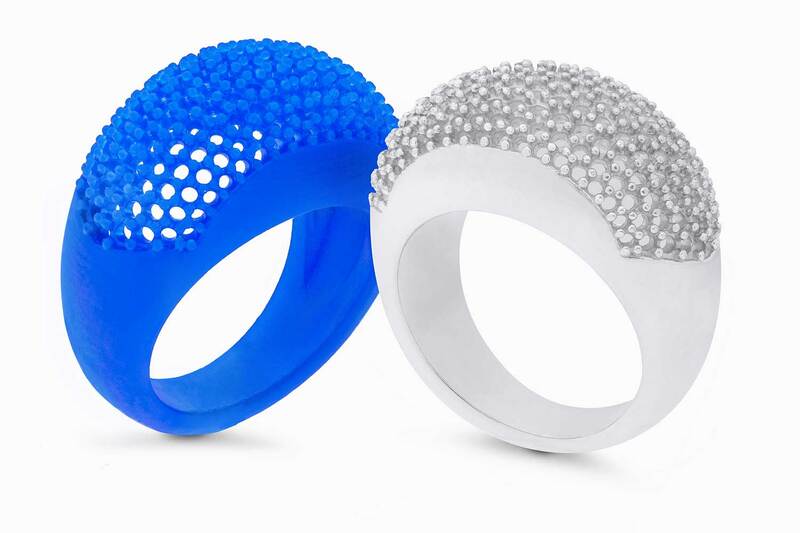 Casting is a popular technique in many industries, jewelry in particular. It can be used for small and large parts in a wide variety of metals. Originating over 5,000 years ago, casting enables creators to work with a wide variety of materials and is one of the easiest ways to make metal parts. In casting, a hollow mold is created from a master, which could be hand-sculpted or 3D printed (as seen in a video tutorial from BJB Enterprises on how to make silicone molds with the Form 2). The master is immersed in a casting material like sand, clay, concrete, epoxy, plaster, or silicone. The casting material hardens, plastic or metal is poured into the mold, and the master is either removed or burnt out to create the final part. You can print a detailed master using a material like Formlabs Castable Resin, which burns out to create a reusable mold. The two processes of thermoforming and vacuum forming are similar to injection molding in that they use heat and pressure to create final plastic parts. These methods first originated in the 1940s to produce aircraft canopies without blemishes and army relief maps. Today, they are commonly used to produce inexpensive packaging where dimensional accuracy may not be as critical and non-uniform thickness is acceptable. The packaging for this razor was creating via vacuum forming. In thermoforming, a heated sheet of plastic is pressed between two mold halves to create a part. In vacuum forming, only one half of the mold is used, with suction used to pull the plastic down over the mold. The machinery used for these methods is very cheap, and it’s even possible to build them yourself. In this diagram, A represents pressure from the reverse mold face, B represents pressure from the plastic being applied to the form, and C represents heat from the plastic itself. When you’re modeling parts for moldmaking, you need to consider factors like pressure, outgassing, and differential cooling and heating. Watch our webinar, Making Molds with 3D Printing, to learn more about these design guidelines and how to get started!